With the above awkwardly worded tweet, the World Boxing Council essentially let the world know on Tuesday that the much anticipated heavyweight title rematch between Deontay Wilder and Tyson Fury will not be happening – at least not for the time being. Although obviously disappointing for many fans, Tuesday’s news came as no surprise. For Fury signed up with Bob Arum’s Top Rank Promotions last week, politicizing the chance of a second go with Wilder (Wilder is aligned with competitor Al Haymon). Fury, of course, had his own ready response for Wilder. “Get your self a bit more well known in America first kid & then I’ll give you another chance. !,” the Englishman tweeted. “I already beat you & the world knows it & so do you must be hard for you that a British fighter has taken over the USA watch me whippppp #ONLYINAMERICA @espn.” In truth, an announcement of a rematch was expected until Fury teamed up with Arum. Now the 27-0-1 fighter will have his fights broadcast by ESPN while the 40-0-1 Wilder’s fight’s will most likely be aired on Showtime or Fox, which works with Haymon. The first fight between the two men went down in California last December. Fury, who was returning to a heavyweight championship fight for the first time since stunning Wladimir Klitschko in 2015, boxed masterfully while champion Wilder spent much of the fight in hot pursuit. The biggest moment in the bout, however, came when Wilder dropped Fury with a thunderous shot in the 12th and final round. To the shock of many, however, Fury got up and finished the round. The fight was ultimately ruled a draw. 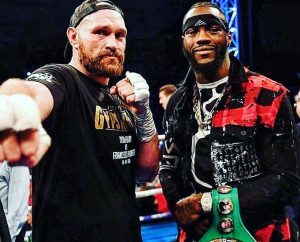 The WBC demanded that Fury and Wilder express their intentions by midweek this week, as a rematch was supposedly in the works. As things stand, Team Fury argues that their fighter will engage in a fight this spring before moving on to challenge Wilder again in the autumn.